He had been sorting through his collection of pub inventories, thinning some out to sell on e Bay so he could make room for more books and had come across two references to the game. I had to admit that the name meant little – OK, nothing – to me. The particular inventory related to the “Kings Head Inn”, Chelmsford, Essex, and was dated 1845. Included in the inventory were a cribbage board and card table. There was no mention of cards, presumably because at the time these were very expensive items and, therefore, likely to belong to mine host and not be part of the general contents of the public house. Also, according to the Kings Head inventory, the external buildings included a ‘temp[orary] skittle shed and seats (thatched)’ and a ‘four corner shed’ with a ‘four corner frame’, ‘4 corner balls’ and ‘4 pins’. Another inventory, relating to the Bell Inn in nearby Little Waltham, dated 1826, included ‘ 6 pairs of quoits’, ‘30 draft men’ and ‘4 corner pins and bowl’. Having no knowledge at all of ‘four corners’, I leapt to the immediate opinion that the game was related to skittles. Arthur R. Taylor, writer of two authoritative books on pub games, kindly pointed me in the direction of Joseph Strutt’s The Sports and Pastimes of the People of England which was first published in 1801. Strutt’s work is often the starting point for anyone interested in English recreations of a bygone age and he did not let me down. Chapter VII includes all manner of skittle games including ‘loggats’, ‘nine-pins’, ‘kayles’, ‘closh’ and – Ah yes! – ‘four corners’. Here then we have the gist of this most simple of pub games. Arthur was also good enough to provide me with a copy of a print from his archives by ‘H. Carter’ called ‘A Game of Four Corners’ and dated 1869, which accompanies this article. 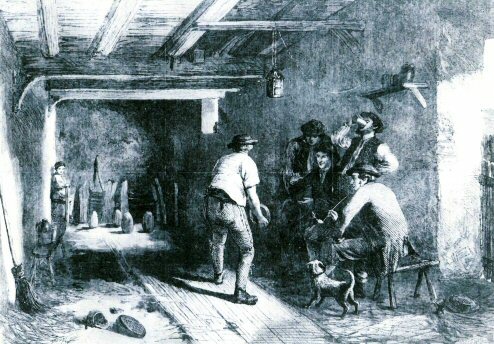 The print clearly shows the square set-up, the action of the player (cheese in hand), the actions of the participants (drinking, laughing, smoking and ignoring the dog), the structure of the alley and the conditions under which they played. It also shows pieces of wood which appear to be set up on end around the pins. This might indicate that the game was similar to ‘rolly-polly’. The variations of skittles are many. A fragment of information about a game of skittles played with only three pins appears in Norman Smedley’s work, Life and Tradition in Suffolk and North-East Essex. He refers to ‘a purely local game’ at the turn of the twentieth century called ‘three-pin bowling’. Here three skittles were ‘set up at points determined by means of a heavy iron triangle, spiked to hold it in place.’ ‘The wood,’ wrote Smedley, ‘resembled that used in the game of bowls but was smaller, and bound with a broad iron band.’ Was this a more skilful version of ‘four corners’? The two inventories of the Essex pubs hint at the popularity of forms of skittles in part of the county but do not allow me to make any wild assumptions that Essex was a hotbed of the game – although I believe it was. NOTE: If any PHS member or visitor to this website knows of any reported sightings of ‘four corners’ anywhere in the country, please response via the Contact page. Strutt, Joseph. The Sports and Pastimes of the People of England (London: Thomas Tegg, New Edition, 1831), p. 273.